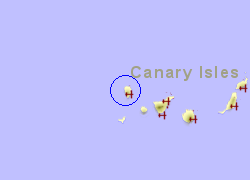 The Caldera de Taburiente National Park, extending to 4.690Ha on the Canary Island of La Palma, contains a large sunken crater, approximately 10 Km wide and 2000m deep, one of the worlds largest. 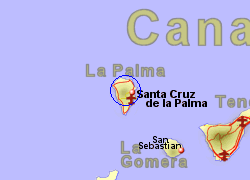 The highest point on the crater rim is the Roque de los Muchachos on the northern side, at 2423 m above sea level while the lowest part of the caldera is at 430 m.
The main attractions of the park is the dramatic landscape , with vertical walls upto 800m high, streams and waterfalls upto 150m high, while the the fertile caldera or floor is home to a large forrest of Canary Island Pine plus species of plant that are peculiar to the area. 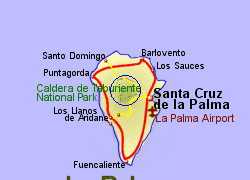 Map of the Caldera de Taburiente area.